2:30 AM wake up. Way too early! Some last minute details to go, a quick bite to eat and we’re out the door. About a ½ mile to the start we decide to have Julia drive myself, Joe Carrara, Mike Weigand & Charlie Cowan to the start. Sounds kind of lame to be driven ½ mile but it’s chilly out, high 30’s and we are wearing extra layers to keep warm until the 4:00 AM gun start. Once we are there, we all sign in and back head back to the car to stay warm. What to wear? Mike Arnstein says we have to go shirtless, right from the start. I don’t think so. Maybe later but not right now. So I decide to wear a singlet figuring we will be warming up with a fast pace right from the start. With about 5 minutes to go, we get ready at the start. No signs of bare chested Mike Arnstein, not even Anton is shirtless. I’m glad today I listened to myself and at least wore a singlet. Forgot an extra pair of gloves to wear though, that would have been nice. 4:00 AM Finally the gun goes off and so do 643 runners in all shapes and sizes. 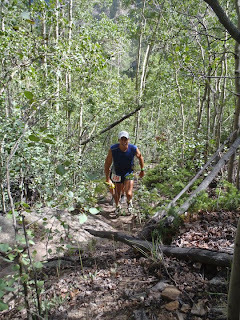 The first leg is about a 5 mile non-technical run slightly downhill to Turquoise Lake. I head out with the lead pack which is probably 20 or so runners. Soon I settle into a comfortable pace, running in the dark with headlamp on. I look over and who do I see but Mike Arnstein with a winter hat, tights and long sleeve shirt. I run along side to say high, “What’s with the winter clothing?”. Mike replies, “It’s cold out”. It’s kind of quiet out and not much noise from any of the runners. I don’t recognize many but I see Anton just in front of me and someone else points out Hal Koerner. Still, no one is pushing the pace and we go onward in sort of a quiet mode heading towards the lake. Just before the lake there is a short uphill climb along a power line. At this point the pack seems to spread out a bit, which is good as the trail along the lake is a narrow single track that winds along the shore line for 6 or 7 miles. On the trail, the pack seems to spread out even more. I settle in behind Mike. Almost immediately I trip and go down hard, landing on my hands. The trail is not very technical but has its share of rocks and roots. I figure I always fall at some point so hopefully this is it. I quickly get up and keep on running. The rest of the run is uneventful and kind of quiet. Soon we arrive at the May Queen aid station, mile 13.5 at about 5:45 AM. Wow, really close to my planned time. The night before I had come up with a race plan. I looked at AJW’s split times from last year and figured that was a reasonable place to start finishing just under 20 hours. If it was a good day maybe I would be faster, if not, slower but it was a place to start. Joe, Mike, Charlie and Nate all had done the same with varying times to shoot for. And Mike had made up some pace cards for all of us to carry along too. At May Queen I had a drop bag but didn’t need anything so I quickly topped off one of my water bottles, grabbed a ¼ p b&j and back out on the trail I went. So far so good but I wasn’t feeling 100%. Not sure but it just seemed like it was taking more effort today and my body was achy, sort of like a low grade fever. The next 10 mile leg consisted of a short section on the Colorado Trail gradually climbing to Hagerman Rd., then it was an uphill climb on Sugarloaf Mtn. getting to an elevation of 11,100, the second highest part of the course. So far so good, and daylight was starting to appear as well as some warming temps. Once at top of Sugarloaf, it was a 4-5 mile decent along the power line. The trail was more like a jeep trail with decent footing but it kept going and going. Luckily we had run this section days earlier but from the opposite direction so I was somewhat familiar with it. I tried to conserve a bit knowing that it was way early in the race and hammering down would not be a good thing for the hammies. I was running mostly alone but never far from other runners. Soon I arrived on a paved road which was about a mile from the next aid station. I looked at my watch and again, right on schedule as planned. 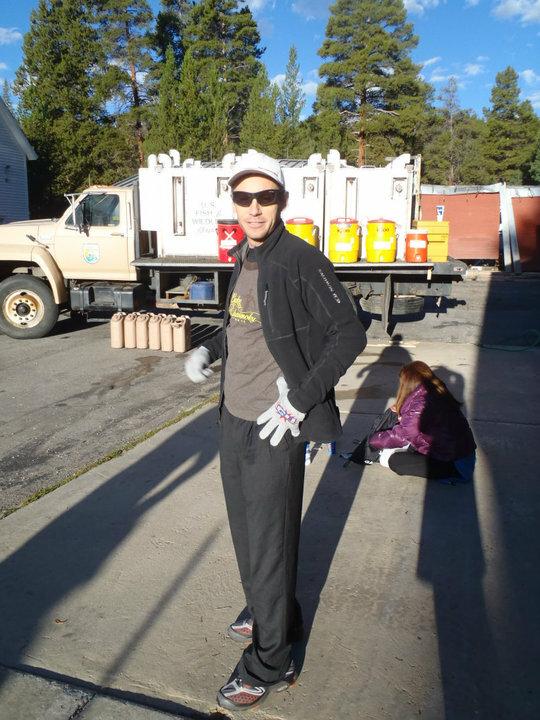 When I arrived at the Fish Hatchery Aid Station, friends Aliza & Chad where there to greet me. They were running the TransRockies Stage Race starting on Sunday so came by to cheer us on and help where needed. Also there was Julia, our shared crew for the early stages of the race and then she would pace for Mike. A quick stop to drop off the headlamp, top off the fluids, grab a quick bite to eat and back out on the trail, or for this section, the road. For the next 4 miles, it was road, wide open prairie type landscape with surrounding mountains. Lots of crew vehicles driving along at this point getting ready for their runners. This was a section where you could make up some time if you were a road runner. Then there was the Treeline area, another power line but mostly flat and straight. There were some runners ahead and many behind all just cruising along. At one point, I could hear a bunch of runners yelling and finally looked back. Apparently I had missed a turn along with another runner ahead of me. I quickly whistled up and got his attention and flagged him down. Nice thing about these ultra’s, most of the runners are very friendly and helpful. A little more flagging would have been helpful as when we are running along, we sometimes have a hard time seeing and the more obvious the better. Now it would be another 4 miles to the next aid station. This part was mostly jeep type trails, nothing too difficult skirting along the foothills of the larger mountains. At the next aid station, Half Moon, the volunteers where happy to see us and offered the usual snacks and fluids. I grabbed my drop bag for a quick refill of my drink mix and gel, grabbed a pb&j and onward. The next section was about 9 miles or so with a combination of jeep trails and then nice single track. I came across Jason Lantz along this section and we chatted a bit. 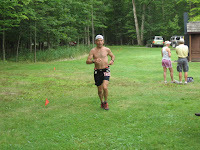 Jason and I spent a lot of time running together at the VT 100 last year. Soon the jeep trail turned to the Colorado Trail which was really nice single track through the trees with the last part a long downhill to the next aid station. On one the sections I was cruising downhill and tripped on a log. Good thing as this was the wrong way, again. Back track and back on the trail. The rest of the downhill was fun, mostly soft footing until closer to the end where it was more loose rock but still fun right up to the Twin Lakes Aid Station. Julia was there to greet me with my drop bag. I quickly grabbed a new supply of electrolyte pills, fluids, had a quick snack and out the door. My time was still on track but I was still feeling achy and every time I took a sip from the bottle my arms hurt. Maybe that fall earlier was harder than I thought. Next up, the stream crossing and other water before Hope Pass. There were some other water holes most of which you could get around. Then the bigger stream. Aliza and Chad were there to cheer me on as I waded through. The cold water felt good until I was almost at the other side and then the numbness and pain sunk in. The water was really cold! It took a little while for the feet to warm and now they were soaked too. I slowly worked my way to the trail going up Hope Pass and was chatting with Thomas, from California. He had some poles for the hike up which he was adjusting for the climb. This section for the next 4 miles or so was fairly steep and I power hiked most of it. Finally I broke out of the trees and could see the top of Hope Pass and the Hopeless Aid Station. 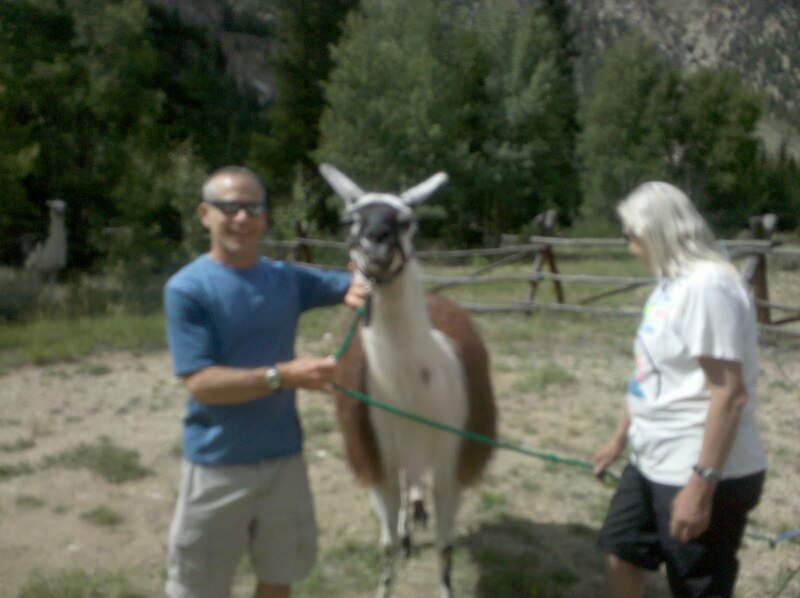 Once I arrived at Hopeless, I had a quick cup of soup, said hi to Vicky (one of the Lama owners), saw my favorite lama, Corky and continued on. Lot of switchbacks to the top but once there the views were spectacular. The elevation at 12,600 didn't seem to be a problem, especially doing more power hiking. Next was the long downhill to the road. Again, I took it conservatively knowing there would be a lot more downhill hammy trashing to go later on. It was fun going though. Soon I was back in the trees heading steeply down and finally to the road. Another 2.5 miles to the next aid station where there would also be a weigh-in. Weigh-ins get me nervous as I always lose a lot of weight initially to the point of almost getting pulled out, but then I level off for the rest of the day. But today I felt different. I felt fat midway through where I usually have lost 6-10 pounds. Today I even had to loosen my waist pack, not good. At Winfield I arrived again on schedule and was greeted again by Aliza. I got on the scale and was only off my pre-race weight by 1/10 of a lb. Something was wrong, I was retaining fluids and even my fingers looked swollen, never seen that before. Aliza suggested I cut back on the electrolytes even though I had taken less than usual already but I listened to her advice. A quick bite to eat, replenish fluids and back on the road for another 2.5 miles with Aliza running along side until the uphill climb back up Hope Pass. After leaving Winfield's I also developed a strong stomach ache. No bathrooms around and no leaves worthy in the woods. I quess I'll have to wait to Hopeless. On the road from Winfield's I passed by Joe Carrara and Nate Sanel as they were running up to Winfield's, part of our Eastern crew. They were both looking strong and were not that far behind. While on the road, I also came across Glen Redpath driving with Chad. I didn't know it but Glen was also running the TransRockies race the next day. I jokingly told Glen he had to pace me up Hope Pass and when I got to the trail, there he was waiting to go, excellent! 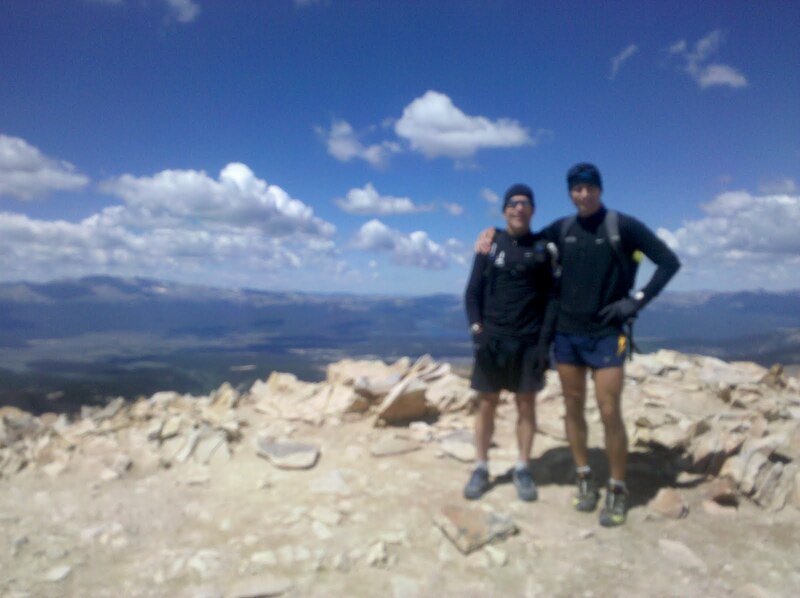 Glen and I have spent many hours on the trails running together. The climb up was slow and steady going up and up and up. Not too far up, Mike Weigand passed by as he was heading down and then Charlie Cowan too. They were looking great and this was their first hundred. Soon we were out of the trees and could see the steep ascent with switchbacks to the top of the pass. Glen was great, telling me when to drink on schedule and to swing my arms. Then he had me eating too. GU time he said so I grabbed a GU. Not good. It went in, it came out. Then I got into a heaving session but nothing else was coming out. I don't mind purging if it's going to be productive but this was only hurting my belly more. After about 4 attempts, I sucked it up and continued on. I had a little bit to drink and felt better. Onward ho. Soon we reached the summit and ran down to Hopeless where I found the temporary facilities behind the tarp. Much, much better meanwhile Glen is yelling at me to hurry up. I thought for time savings but no, he needed to use the facilities. A quick drink, food, replenishing of fluids and down we went. We were off to a slow trot. My body was aching and I was doing all I could to run. Usually this would be the fun part as I really enjoy the hills. We came across Hal Koerner, I guess he wasn't having a great day either. Then I came across Sherpa John. He still had to go up and over and back. He was looking a bit tired and I hi 5'd him as I went by. John was attempting the Grand Slam this year. Hopefully he would make it in time. Glen and I continued on with Glen pushing me to run. I was having difficulties but still able to run most of it with the occasional walk thrown in. Finally we were out of there and now had the final mile or so to cross the stream and then to the Twin Lakes Aid Station. Glen had all he could do to keep me running as my body was not happy. While crossing the stream I had an extended stay. The water felt great this time through and I got my head wet and got in deeper to fully immerse the quads. The final slog to the aid station and Glen was done. At Twin Lakes, Julia was there with my bag and helped me change my shoes and socks. She even arranged for a pacer for me. I thought that would help me get going. I refueled, ate, grabbed more electrolytes but had a hard time getting out of the chair. Meanwhile, friend Joe Carrara came in. Even with his not so good knee, he was able to catch me on the downhill. Joe was looking strong and pumped to keep going. I met my pacer, Greg, from Lincoln, Nebraska and off we went. Joe was right there too. And up we went, and up and up on the Colorado Trail. It was slow and steady but I was still passing some other runners. Joe had moved ahead and was doing great. He hadn't run a hundred since 2005 so I was hoping he would be able to hold it together. He was in the best shape of his life and had trained really hard this year so I was confident he could pull it off in style. Meanwhile, my pace was not getting any faster. Greg would try to pull me along and I ran some sections, slowly. We even caught up to Mike Arnstein, to my surprise and his. I guess he was not doing so good either. He would run for a while, then walk. We kept this up for a short time, then my body just wouldn't run any more. I had no energy and my body ached. And I still felt like I was retaining fluids. It was a slow walk to Half Moon and not much different up to the Treeline crew access. There Greg was to be replaced with another friend of his. At that point I didn't see any reason to have a pacer walk with me. I even thought of DNFing...but no, I couldn't do that. I came all this way, damn it, I'm going to enjoy the night even if I have to walk all the way to the finish. I was trying to figure in my head when I might arrive at the finish if I could average 3 miles/hour. I could possibly still get in under 25 hours, not plan A but I could live with that. Could that be possible? It was starting to get dark now as I was leaving Treeline heading off to the road section towards Fish Hatchery. The road was long and unforgiving. I tried to run, but no going. The body was not following. I arrived at Fish Hatchery as darkness set in. I enjoyed my stay there, grabbed some warmer clothing, a second headlamp, ate some wonderful potato soup while chatting with other folks and off I went. Next up, Sugarloaf Mtn. The climb up Sugarloaf was slow and quiet except for the buzzing sound of the power line overhead. I could see a light up ahead and one below but no one was making it any faster. Finally up on the top I came across another runner bent over, purging. At a low point. We chatted while we were walking along and he was attempting 100 # 3 of the Grand Slam. I told him DNFing was not an option and that he was going to finish. Soon he was feeling better and took off. 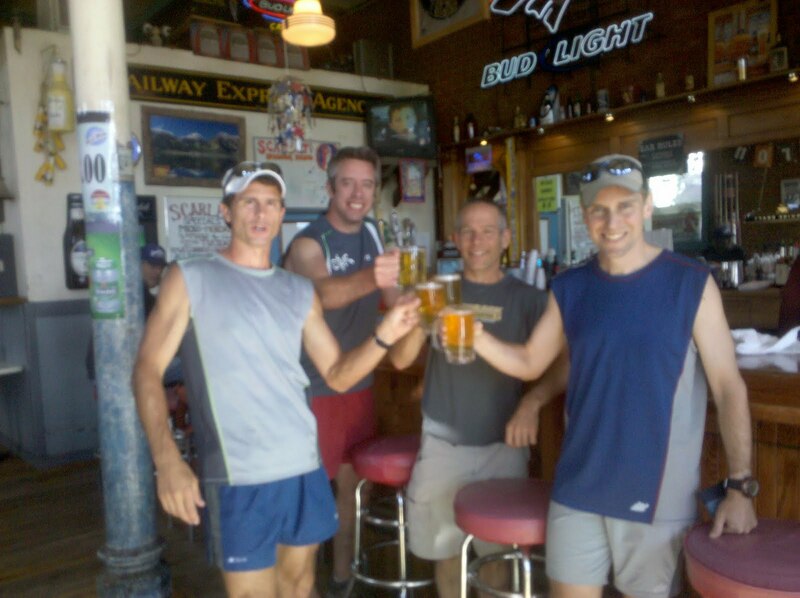 After Sugarloaf, it was down the Colorado Trail and off to the final aid station, May Queen. May Queen had a nice warm inviting tent set up with food and drink and chairs. A dangerous place to get too comfortable. I grabbed more potato soup and was trying to figure out in my head where I was at with time. I can walk quite fast and was now looking like I could possibly break 24 hours, amazing. I grabbed some chocolate cookies and stored those in my pocket for later on and out I went into the cold. The almost full moon was shining on Turquoise Lake and it even kept it somewhat bright in the woods. About halfway around the lake I came across another runner going slower than me. I laughed as it was Mike Arnstein again. He thought I was stalking him. We chatted and then I passed him as I was walking faster than him. Not far from there I could hear another runner approaching. It was Nate Sanel, a running client of mine. I was getting worried that he had fallen back but no, he was in great spirits and really enjoying the run. We chatted for a short time and then I told him he had to get going. He hooked up his tunes and happily ran off with his pacer Jeff, tryng now to break 23 hours to the finish. While we were chatting, Mike Arnstein had another surge of energy and ran by again. Will I see him before the finish? From there it was out of the woods and onto the road for the long slog uphill to Leadville. This seemed to take forever. With about 2 miles to go on this long uphill dirt road I could see a light in the distance up front and one way behind. Up front it could be Mike or Nate, behind it could be anyone. I kept tripping on some loose rocks and was getting annoyed. I wanted this over. Believe it or not, I found just a little bit on energy to do a run walk combo for a while and all the way to the final 1/2 mile to the finish. I was along the road and turned off my light as there was enough light to see without it. Suddenly I realized it was Nate just ahead of me and slowly caught up. He had no idea until he looked back and saw me. 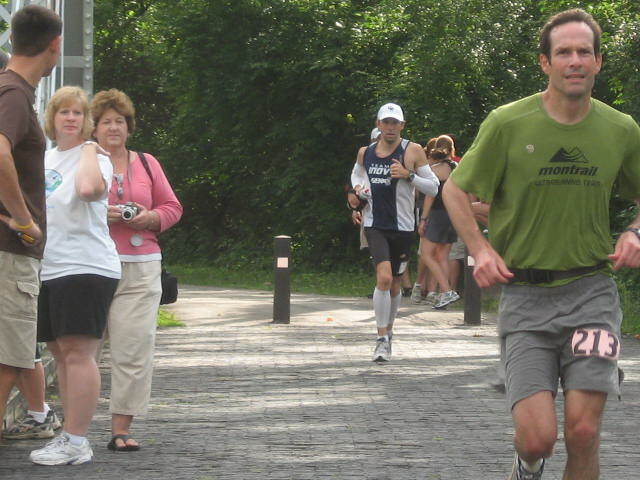 He freaked when he saw me and took off in a fast sprint to the finish. I told him he better run and laughed all the way to the finish. I finished in 23 hours and 7 minutes, about a minute behind Nate. Not that far behind, Charlie Cowan finished in 24 hours and 24 minutes while Mike Weigand with Julia Lewis pacing him, finished in 27 hours and 36 minutes. Joe Carrara had a great race, even though he slowed down near the end too, finishing in 21 hours and 50 minutes. So we flatlanders from the East all made it in, finishing in respectable times. THE GEAR: For the first 60 miles I ran in the new Mizuno Wave Cabrakan 2's which were fabulous. After the second stream crossing I changed over to the original florescent orange Cabrakan's opting for dry feet and fresh socks. I wore the Mizuno shorts and singlet most of the race but at nightfall as temps were dropping I put on a fresh Mizuno tech T and used the Cabrakan shell which is the ultimate lightweight shell and it was awesome. Thanks Colin! Although this turned out to not be my day it still was a great experience. We've had a great time training hard for the past 6 months, had a spectacular week in Leadville leading up to the race and are now looking forward to next year. Hardrock?? We will see. As I look back I try to find where I lost time. Not every day can be right on. The fall I had early on may have been more serious than I thought as 5 days later, my wrists are still swollen and ache and I have lost some motion. Was my nutrition off too, why was I retaining water? 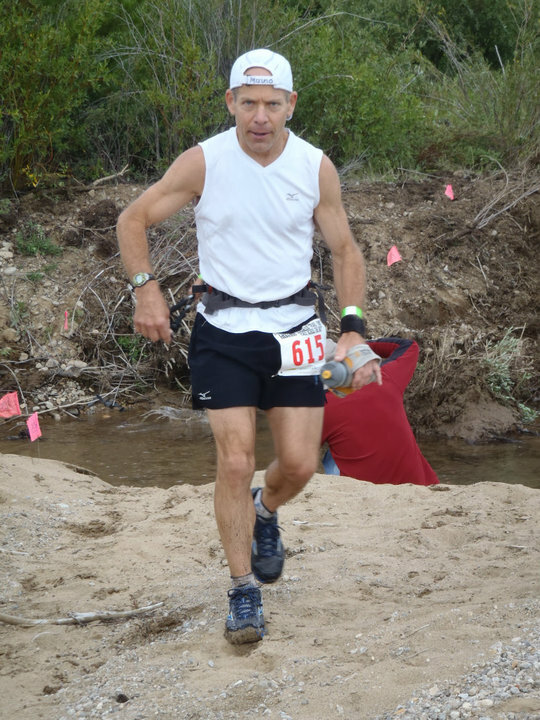 And was this too close to the Burning River 100, only 3 weeks prior to Leadville. Yes, it's finally here. The race starts tomorrow at 4:00 AM. Woke up this morning to see snow over Hope Pass. Got out for a easy 5 miler this morning on the Mineral Trail, an interpretive trail about the mining operations in this area. Then it was time for the medical check and weigh in. The weigh in always scares me as I usually lose a lot of weight in the first half of these races and am close to the limit. No breakfast until after the weigh in but in the end, there were no surprises. Weight was where I figured it would be. Tomorrow I just need to remember to be smart about hydration and electrolyte replacement which for me is most important in whether I have a good race....or not. In any event, I will make sure I enjoy myself during the race and have fun with it no matter what. The views will be too spectacular to ignore and I'm sure all the volunteers will be wonderful. 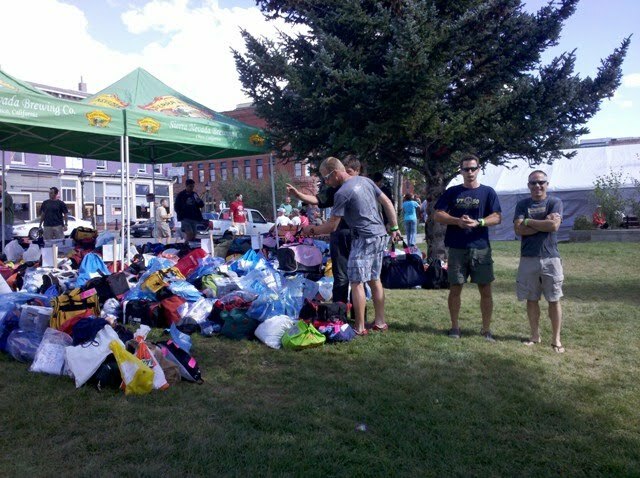 We also dropped off our drop bags this afternoon as we have a limited crew. Julia Lewis arrived today to help out. She will be group crewing for us as much as possible and then pacing for Mike later on. Organizing drop bags is always a challenge and trying to calculate where you might be to estimate fluids, electrolytes, clothing, headlamps, etc. After we dropped off the bags Joe took us on a little baha driving to get to the famous Leadville sign so to get pics. Then it was time for the real pre-race pasta dinne and then early to bed tonight as we will be up at 2:30 am on Sat. Here it is Thursday already, just 2 more days until race day. We're still hanging out like tourists and today we took a ride to Independence Pass. This was part of our altitude training as the pass is located at 12,100 feet. The road is an adventure in itself with narrow twisty turns, steep drop offs and hairpin turns. Once we got Joe off his cell phone he could better focus on driving us up the pass. Heading to the Pass we drove through some rain and the skies looked threatening but the time we arrived at the Pass, the rain had stopped. 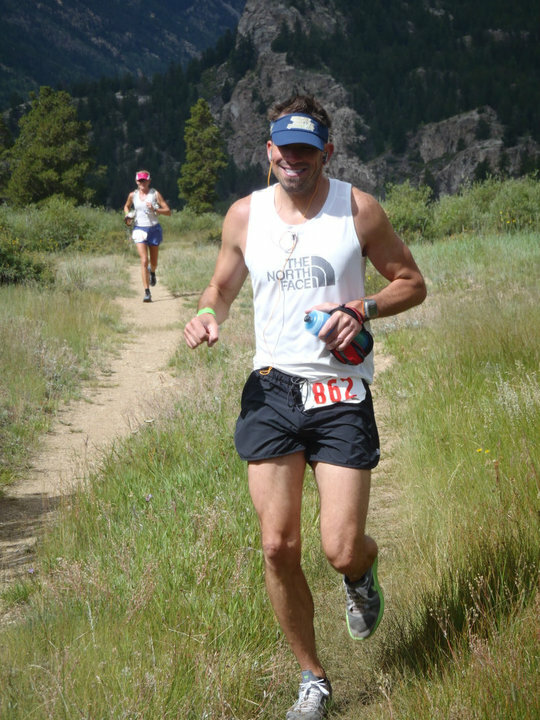 The top of Independence Pass is located at 12,100 feet, another great way to acclimate for the race. 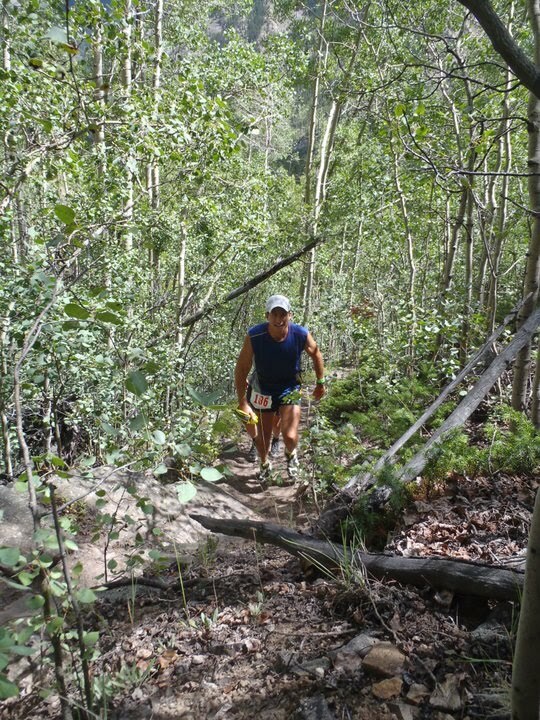 We found a great single track trail to run along that traversed the ridge and rose to an elevation of 12,800 feet. After about 2 miles we hung out on this knoll in awe of the surrounding views in every direction. Even with the clouds the mountains were everywhere. After a short visit, we ran back down to the car and ventured back down the road towards Twin Lakes. There we checked out part of the Leadville course that traverses through the marsh land before it rises up to Hope Pass. 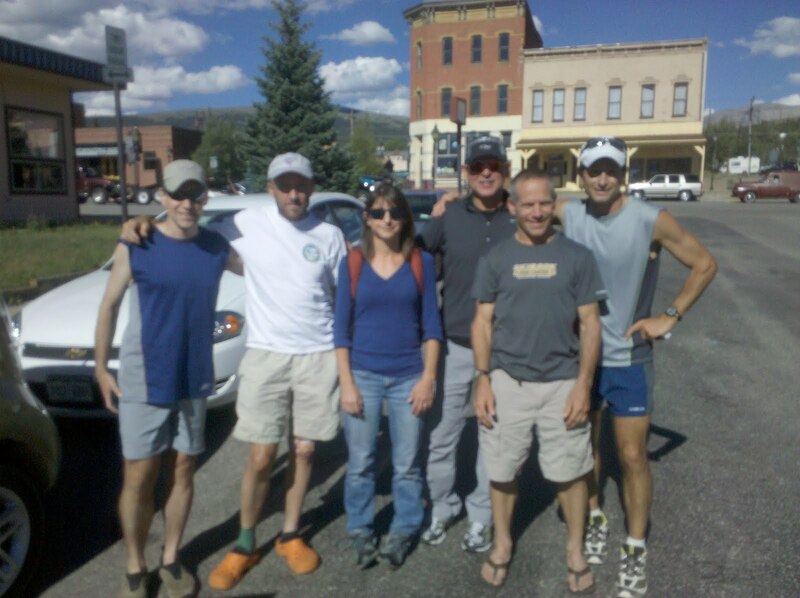 And then it was back to Leadville to settle into our new condo on 11th St. before heading over to the pasta dinner and race packet pickup. The rest of the night was spent organizing drop bags as we need to have them ready for Friday by mid day. The end of another day in CO.
Another blue bird day today. Joe and Mike were busy doing work this morning as I slept late. Then it was time for the usual breakfast with waffles, pastries, cereal, etc. We headed out to meet Charlie and Gerry this morning on the Hagerman Rd. and planned on running from May Queen to Hagerman Rd. on the Colorado Trail. Joe, Mike and I planned on running back to May Queen too. We dropped a car off on Hagerman Rd., and then off to May Queen. There was a slight uphill on the road to the Colorado Trail then it turned into very nice single track. The trail was soft and dry with a slight uphill for most of it, then a steeper climb to Hagerman Rd. The lungs felt great today and no problems on the uphill climb. Once we got to Hagerman Rd. I continued up to where Sugarloaf Mtn. dumps out, a gradual uphill for another mile. The return trip was even nicer with a gentle downhill back to the May Queen aid station. After the run, we drove parts of the course from Fish Hatchery to Half Moon to Twin Lakes and then the 12 mile dirt road to Winfield. Along the way at Twin Lakes we ran into one of the lama crew, Vickie, with her 4 female lamas. Corky took a quick liking to me so we have a date to meet on Saturday up at Hope Pass. Another great day in CO. Here it is race week and we should be resting but there's too much to see and do here. Today was a bluebird day and it was too nice to pass up the opportunity to bag a 14er. Never having been that high before I figured this would be a great way to acclimate to the high altitudes of Leadville. 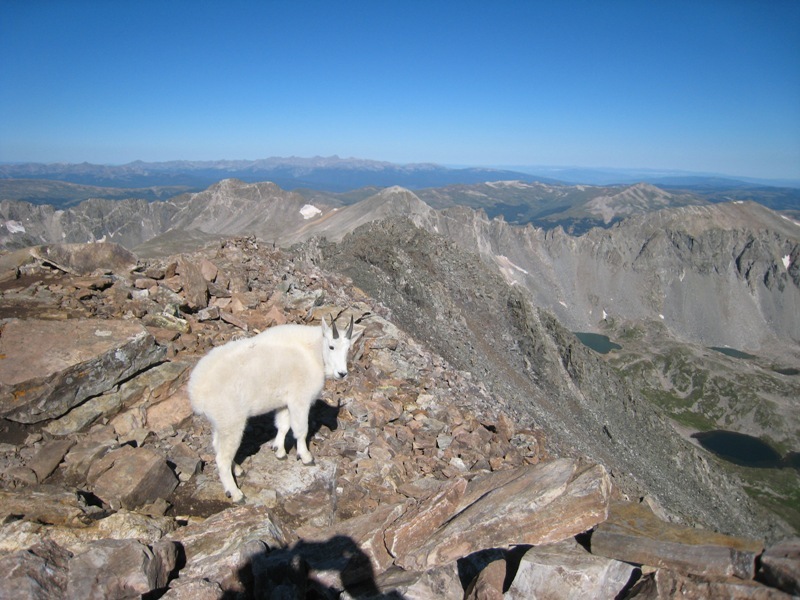 Mike snuck out early to meet an old friend to bag their own 14er, Mt. Quandary at 14,265. Joe and I slept in late and took advantage of the breakfast and carbo loaded again with waffles, etc.. After breakfast we grabbed some lunch to have at the summit and headed out to Mt. 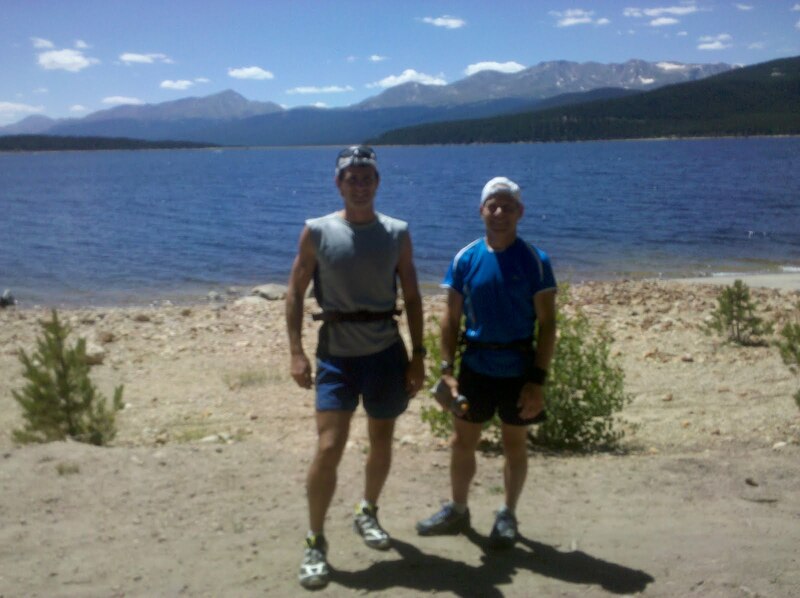 Sherman, just outside of Leadville at an elevation of 14,036. Luckily we were able to drive quite a ways up and could start at 12,000 but still there would be a 2,000 ft climb in 2.25 miles. On the drive up there are a number of old abandoned mines and interesting landscapes and of course incredible views. There are no signs but a website at 14ers.com has great directions and pics to find the way. The sun felt warm but there was a wind humming through and we knew it could be cranking on top so we packed some warmer clothes. Once on the trail there was a slight downhill, a small stream crossing then up, up, up. We were able to run some of it then it became more of a power hike. Lots of loose rock and steep climbing made the calves burn a bit but the elevation factor seemed to be fine. By the time we got half way up, the wind was really blowing up through the pass. We decided to layer up which included hats and gloves. Other hikers were wearing full winter attire. It was a power hike up most of the way from there, went through a knifes edge and then came to the final accent, a nice runnable trail to the summit. Yes, running along at 14,000 ft. At the summit the wind seemed to die off and the views were just incredible. Mt. 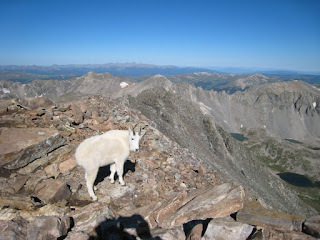 Sherman, 14,036, my first 14er! We found a nice rock wall on the back side and sat down to enjoy lunch while acclimating. We probably hung out for a good half hour before descending. On the top we found a memorial stone from some hiker who must have died back in 2005, a bit spookie. Descending was certainly easier but there were a lot of loose rock so I had to be a bit careful as my ankle is still tender. Time up was about 1:07, coming down was 40 minutes or so for the 4.5 mile round trip adventure. Another great training run! Mike had a great hike too and met up with some rather large critters. Burning River 100 is over and done with. Now it's time to focus on Leadville. 1 week of recovery, 1 week of taper and now it's race week. Let the fun begin! I arrived in Denver Saturday mid-day after an easy flight beginning at 7:30 AM in Burlington to Chicago to Denver with fellow VT ultra runners Joe Carrara & Mike Weigand. We're here a week early in hopes of acclimating to the high altitudes. We grabbed a rental car and headed off to Boulder to visit a college buddy of Joe's for an afternoon lunch BBQ. Had an excellent time and great food. This started race week off with some serious carbo loading. Afterwards we headed to the mountains. For the beginning of the week, we'll be staying in Silverthorne, about 25 minutes from Leadville. And from Thursday through Monday, we'll be right in Leadville. 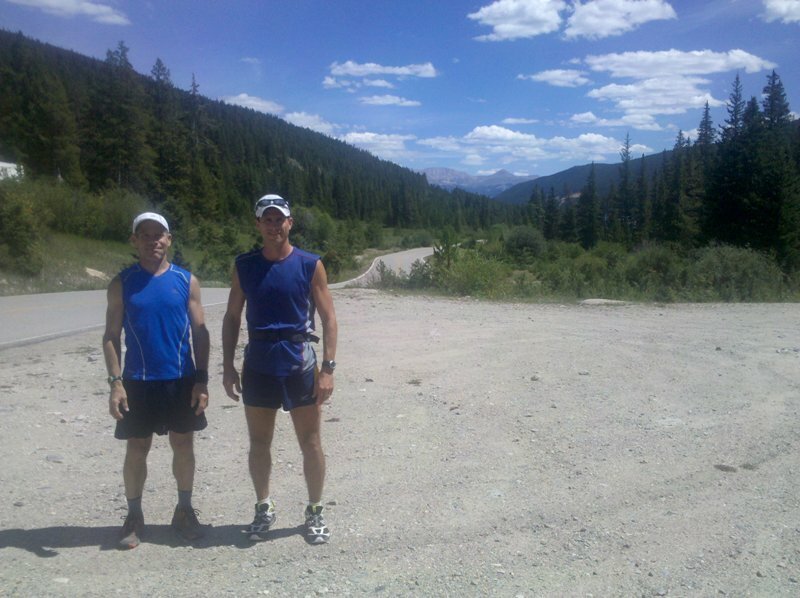 On the way to Silverthorne, we stopped at Loveland Pass, altitude 11,900 for training run # 1. We planned on doing an easy 4 mile run going up the trail to some peak with an elevation of 12,500. 4 miles is usually no big deal but get 3 flatlanders running uphill at over 12,000 feet, just 12 hours from leaving home with an elevation of 400 feet, and it can be quite the experience. As soon as I got out of the car to put on my brand new Mizuno Wave Cabrakan 2's, even bending over was a challenge. I felt a bit light headed and was moving rather slowly. As soon as we started out, the run became more of a run/walk. The lungs were feeling odd and the head was on another planet. I could barely run/walk a straight line. Finally we arrived at this unknown peak only to continue on running down the ridge a bit further to get in the full 2 miles out, as according to Joe's Garmin. On the downhill, I was starting to feel better. Only to turn around and run back up this peak before the long descend back to the car. The head was in and out of the clouds and the lungs were working harder than usual. We all survived but all got a reality check about the altitude. Afterwards, we arrived in Silverthorne and checked in to the hotel. I got to finally sleep late and then it was breakfast time. Free continental breakfast and they have a waffle maker, my favorite! Pastries, bagels, fruit, muffins and of course the waffles, yes I had all of that. A great way to start the day and prepare for the days run. Today we planned on running the first and last 13 miles of the course. Being an out and back course it makes it easier to preview as you only have to run half the distance to see the entire course. We started the run at the May Queen Aid Station area, elevation about 10,500 and were running the course back to the finish line. The first half of the trail runs along side Turquoise Lake. A very nice single track trail with incredible views all around. I was feeling great at this altitude with no problems, or so I thought. Immediately at the start of the run, my lungs were not feeling right again and I was getting dizzy. I did some "power breathing" and relaxed, slowing down a bit. After about 2 minutes I was feeling much better. Onward to enjoy the run. We ran at a decent pace without pushing too hard and the trail was in excellent shape and only slightly rolling. Very Nice! I can handle this. 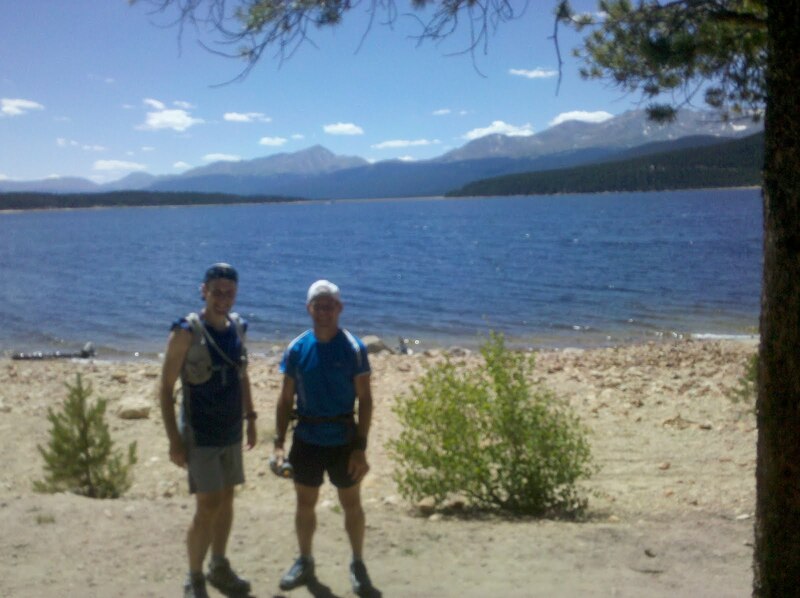 After running around the lake, it was on to some power line trail then a combination of paved and dirt roads towards Leadville in the hot sun. I took it easy on this gradual climb back into town enjoying the scenery along the way. The final 1/2 mile was a slight uphill climb to the finish in downtown Leadville with some amusing remnants of the bike race held the day before visible on the road. Chalk writing on the road said, "Lance is a wimp". 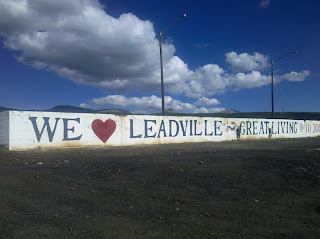 (Lance backed out of the bike race at the last moment and the town of Leadville made it well known). Afterwards we met up with Charlie from Lake Placid and a bunch of fellow ultra runners from Texas for some pizza at the local pizza joint. After lunch we spotted an establishment on the main road offering a 2 for 1 special. 2 PBR's for only $1. How could we turn that down. And they were ice cold and tasty! A great way to end the day in Leadville. Day 3, Monday August 16, 2010. Breakfast and waffles again after sleeping late. A great way to start the day! Today we planned on running Sugarloaf, the second highest peak of the race at an elevation of 11,100. We had planned on running this with some of the fellow Texans we met the day before and with Charlie but the rains had come in and it was pouring. Everyone bagged it except for Joe, Mike and myself. Charlie helped us drop a car and then headed for the hot springs. It sounded like a good idea as we sat in the car preparing to step out into the rain for this 7 mile jaunt. Once we got going the rain was not a problem and it stopped within the first mile. A bigger problem were my lungs, that strange feeling again deep in, but again after a couple of minutes, they felt fine. After about a mile on a road, we headed onto a trail and up the power lines to climb to the top of Sugarloaf. Nothing too technical but a good steady climb with many false peaks. But there were also some plateaus and small sections of downhills on the way up. I took it rather slow and steady sort of race paced as this will be the climb from mile 78. Once we reached the peak it was another 2 or so mile downhill to the car. Nothing too steep but a good solid downhill effort with some tricky footing near the end. We lucked out with the weather and it turned out to be just right with cooler temps and overcast skies. Afterwards we headed to Leadville and had lunch with Charlie at a local spot in town. For excitement after lunch, we got to watch Joe get his hair cut at a local barber in Leadville. Her name was "Mud" and she was a biker chick so she and Joe got along just fine. The new Mizuno Wave Cabraken 2's arrived on my doorstep Friday miday. Just in time for Leadville. Have run in them since Saturday on all kinds of terrain. Very Nice! 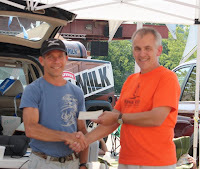 This year's 2010 USA 100 Mile Trail Championships were to be held in Willoughby Hills, Ohio on July 31, 2010. Deciding to crew and pace at the VT 100 2 weeks ago instead of running it created an opportunity for me to attend this year's Burning River 100 miler before heading to Leadville later in August. A trail race in Ohio? I really knew nothing about Ohio other than driving through it one day in 1980. But after some research, I found out about this really neat trail system that runs through much of Ohio and through the Cuyahoga Valley National Park. So time for a road trip, 12 hours from home in VT. I loaded myself into the car with my newest companion, a Garmin GPS for navigation. The last couple of road trips I had some difficulties and doing the guy thing of never asking for directions and being lost was getting old so this would hopefully make the trip more enjoyable with less wasted time. Also, the course handler stations were all laid out with GPS coordinates so I plugged those in to help navigate around the course. I broke the trip up into 2 spending the night at Niagara Falls with a day trip the next day to see the Falls as I had never been there. 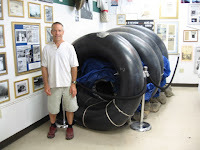 Niagara Falls were OK, I think I was a little disappointed and expected more but the most awesome part was the Daredevil Museum located in some dumpy little store around the corner. Inside were the actual "crafts" used to go over the falls. Hmm, ideas. I've always thought about a trip over the Falls. And after viewing the Falls I determined the Horseshoe Falls was the one to drop in to and not the American Falls which are way too rocky upon impact. And after viewing the "crafts" I think the simpler is better. 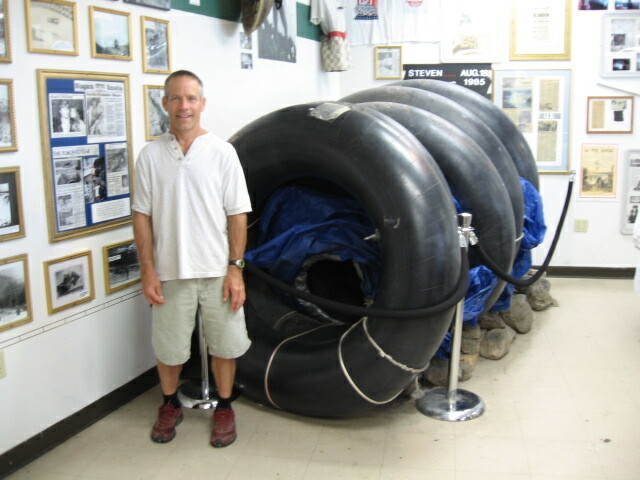 Maybe just an inner tube for better viewing and also to be able to dive under while getting away from the pounding waters. We'll have to put that on the to do list for another day. I have a race to run and I don't want to risk injury just days before. Time to drive to Ohio. 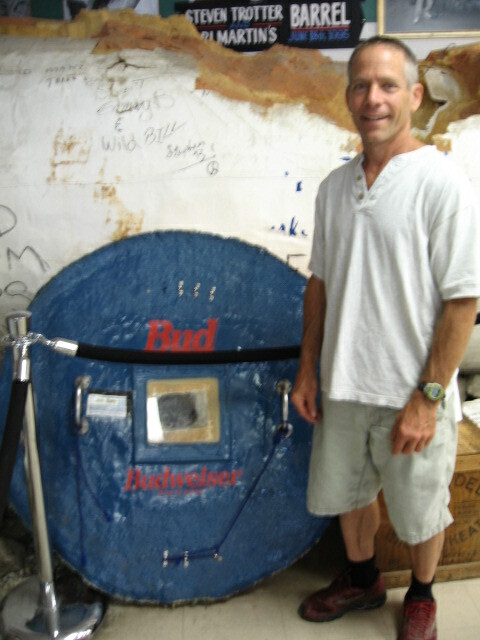 This one had the Bud lid too. On I went to Ohio. I arrived on Thursday afternoon so I could preview a small part of the course. Being in "taper mode" I was trying not to run too much but that never seems possible. So I headed over to the Boston Store and did a short 5 or 6 mile loop. And of course I got lost. I went over to Happy Days to run around the Ledges area and to see how my ankle was feeling on the rougher terrain. It was still quite sore. I tweaked it pretty good just over two weeks ago, not running but on a bad landing while skydiving, another one of my hobbies. A gust of wind hit as I was landing and threw me sideways and down hard. Ouch!! I had been running in an ankle brace ever since so this was the first time on trails without the brace. It hurt. The downhills were still painful, the side hills too but the uphills were OK. I'll just have to live with it for tomorrow is race day. I'll make adjustments. Later that evening I went over for the pasta dinner and didn't recognize any one. Finally I did see some familiar faces, Leah and Rob Perry from Maryland, acquaintances from the Finger Lakes races in July. Time for bed so after dinner I drove up to Willoughby Hills to spend the night closer to the start line. The start was at Squire's Castle, 5:00 AM and still dark. At home it was getting light at around 4:30 am as that's when I drive to work every day but here at the far end of the time zone it was still dark as can be so I decided to at least have the headlamp with me. The first part of the course was on the roads so I don't think I ever used the light. It was fast out of the start with some one really far ahead. I thought way too fast. I was not far behind and in some kind of loosely formed lead pack. Slowly the guy ahead dropped out of sight and I was running with Todd Braje. I recognized the name as one of the contenders. Nice young guy from California. 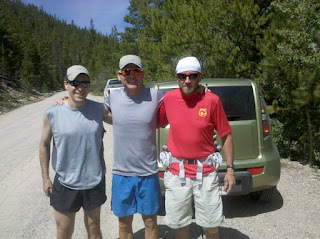 We ran together for a while and then we were joined by Eric Grossman and Scott Dunlap. But there was some other guy running ahead, in white spandex and headphones. Not sure what that was all about but eventually he dropped out of sight too. Meanwhile the 4 of us ran along and chatted while Scott ran in front at times trying to take our pictures while on the run. It seemed to be a comfortable pace. Shortly after one of the handler stations, we missed a turn and got really lost. Scott seemed to have found the right way but Todd, Eric and myself were backtracking until we found someone else and discovered the Buckeye Trail, which got us back on track. Meanwhile another pack of runners took over the lead. Soon we caught up again. In the group was Mark Godale, a local legend who would guide us on the right path as he knew this course as well as any one. Also in the pack were Jay Smithberger, Phil Kochik and some others. Eric in the lead with Todd right behind. The course meandered through the woods which was way better than the earlier roads. There were some stream crossings too but it was mostly passable without getting the feet wet especially following Eric. Eric had a way of finding a good line with the least amount of water getting into the shoes. Worked good until I stepped on a rock which was like walking on ice and down I went. Not only did the feet get wet but my whole body slammed into the water and rocks. So much for the good line. Nothing unusual for me, falling on the trail. I was still cautious on the downhills with the ankle as it still hurt quite a bit and there was a long way to go. The pack was thinning again with Todd and Eric holding the lead with myself not too far behind. I had settled into a grove and felt good trying to conserve a bit for the mid-day heat was coming and knowing that I always hit a low point then but come back later as it cools. Well that was the plan anyway. Todd and Eric were still in the lead with me behind. But then there was Eric walking through the woods. Leg issues, he was done. Too bad as Eric was looking really strong. 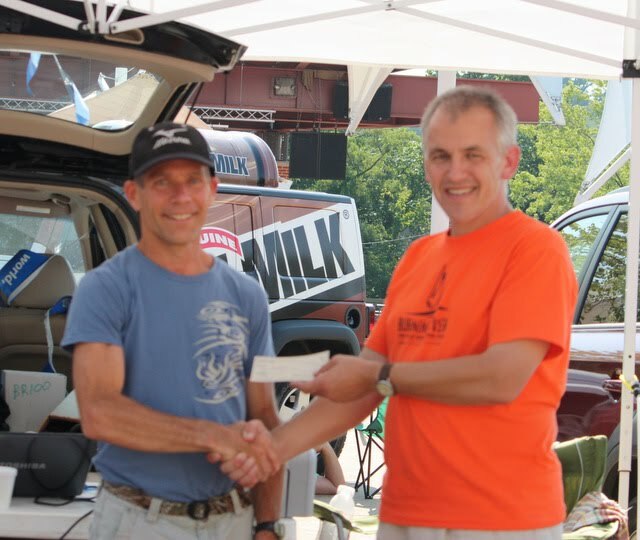 I remember the only other time I met Eric was at the VT 100 in 2006. He finished just ahead of me and I remember him commenting at the finish that he would rather be passed by a girl than by some old guy. Well Eric is now in his 40's, and getting to be almost an old guy. Watch out Eric, it will happen. Me coming into an aid station. So onward on the course. As it was getting warmer, I was starting to feel the heat and backed down a bit. Meanwhile Phil passed by as did Mark. More trails, more road and tow path. I never knew what a tow path was before but I certainly do now. It's a flat as a pancake wide trail with either gravel or pavement that goes on forever. Yes you can pick up the pace but it also tires you out, too. I couldn't wait to get off and back on the trails which felt so much better. Somewhere around mid race I started to cramp. Heat and loss of electrolytes has always been an issue with me. I have it figured out for the most part but sometimes have to make adjustments. I was loosing a lot of sweat but to drink more could put me in more trouble so I had to adjust my intake of electrolytes and experiment a bit. Within an hour the cramping was gone and off I went but still conserving a bit. I would say the highlight of the aid stations were the sponges. 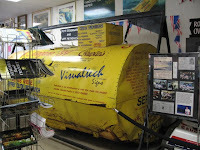 To grab a sponge from ice cold water and wipe your face and head was a real treat. At ever station the first thing I would look for would be the sponges. The watermelon was good too but the sponges were key to surviving the heat, unless you had an ice vest like Todd. Todd with his ice vest. Somewhere after Happy Days, Nathan Yanko passed by as I was dealing with heat issues. And Jay went by too. I try not to get worried about others going by and run my own race. I know that there will always be those who blow up and drop out and others who tire out near the end. I tend to get stronger later on in the race so no worries. Speaking of dropping, just before Sound of Music Hill Phil was walking and done. Too bad as he was running well too. It was getting warmer and up to the Pine Hollow was exposed to the hot sun. I knew after that it would start to cool some as the day was getting on. But just before Pine Hollow I needed a cool down and stopped for a quick visit at Kendall Lake. I figured I could quickly dip my head in. Not so, it was a duck pond with poop everywhere. Still, it was water so I took a quick cool down amongst the droppings and off I went. On the second loop around Pine Hollow I managed to awake some hornet as it attached to my leg for a good sting. Hmm, could bee venom be good for energy? Whatever, there was nothing I could do. Onward towards the Covered Bridges. All I remember are corn fields and dogs in this section. Some dog came after me and I had to turn quickly which really aggravated my ankle. Luckily not too bad. By the time I arrived at the Covered Bridges for the second loop, I had caught up with Jay and Nathan on the hills in the woods. They both were not doing well on the trails. But at the aid station heading out of the Covered Bridges, they both took off quickly and ahead of me. I was doing a quick shoe change. I had been running in the Mizuno Cabrakens, a fabulous trail shoe but now was changing to road flats as I heard it was mostly flat and hard for the last 15 miles. So I put on fresh socks and my Mizuno Wave Musha 2's. I call them my sparkly shoes as the have sparkles in the laces. The girls love them. Mizuno Wave Mush 2 sparkle shoes. After leaving, it was roads for a while. The light shoes felt great and I could see I was gaining on Jay and Nathan in the distance. Finally the course headed into the woods with some hills. Did I say I like hills? First I caught up to Jay as he was walking up a hill, then it was Nathan. I figured this was my chance to try to get ahead as more flats and tow paths were to come and these guys fly on these roads. Jay has legs that are as big as me and can do one stride for two of mine. I built up a decent lead but you never know how far ahead you are when you are being chased. I came into the Car Wash Aid station after a long bout with a tow path, not liking it. Food, I need food. I saw a grilled cheese and chips, what a great snack! Meanwhile more tow path lied ahead. As I departed I turned onto the dreaded tow path. There was a nice couple going the other way as I swallowed an electrolyte pill gone bad. Awhgg, not good. It's coming back, quickly. I held it together as the couple walked by and then stopped and did the AWJ spray. And another 2 or 3 times. In case you don't know the AWJ spray watch the video of Andy Jones-Wilkens at Leadville last year. It's not unusual to purge and it was time to empty the stomach. A real pro at purging can run and purge at the same time without loosing a step, like Todd Walker. Not me, I have to stop. Anyway, I stood back up, felt great, had a quick wash of water in the mouth and onward ho again. It was time to end this journey. The tow path didn't seem as bad this time. One more quick aid station and then up more hills. Yes hills, got to love them and a chance to gain some more time. Shorty thereafter a local park too with trails and hills, even better. It was starting to get dark but not dark enough to turn on the headlamp which I picked up at the Car Wash Aid Station. One more stretch along the power lines and on to the city streets. I had no idea where I was but knew the end was near. Finally I was right there with the time clock in front of me. Done in 16 hours and 22 minutes. 3rd Overall Finisher and 1st in the Grand Masters. Todd ending up coming in 1st with Mark 2nd. Afterwards I climbed into the fountain along the finish line which felt so good but only to be informed by a concerned citizen about the posted electrical hazard in the fountain. Not feeling a need for an electrical shock I opted for the shooting water spraying out of the ground next to the fountains to celebrate the end of another 100 miler. Thanks to all the volunteers for their amazing help throughout the race and for Joe and his crew who put together a very well organized and fun race. Also thanks to Colin and Mizuno for awesome sneaks and clothing.